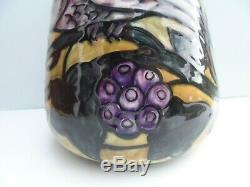 Tube lined decoration depicting owls in flight surrounded by entwined green leaves and purple berries on a mustard yellow ground. 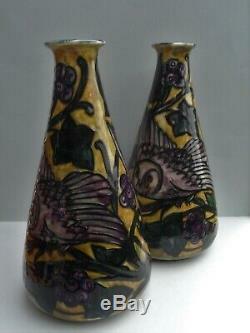 Designed by George Cartlidge who was employed between 1918 & 1926. 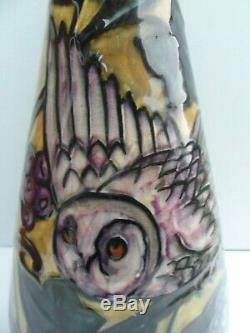 His tube-lined patterns resembled production from Moorcroft and his designs may have been intended to compete with that company. 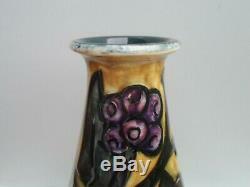 The back stamp dates these vases between 1918 & 1926. 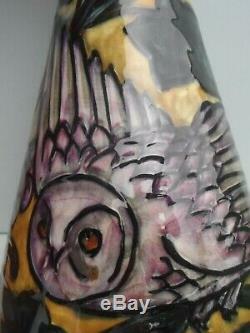 Shape number C73-1 is hand painted on the underside base of each vase. Dimensions: diameter of base 102mm (4 inches) / diameter across top 51mm (2 inches) / diameter at widest point 133mm (5.25 inches) / height 255mm (10 inches) / Each vase weighs just over 1.25 kilos in weight before any box or packaging. 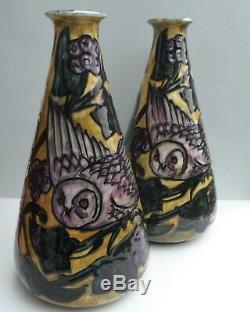 Condition: Both vases are in very good clean condition with no chips, cracks or restoration. Minimal faint light crazing can only be seen under very close scrutiny. 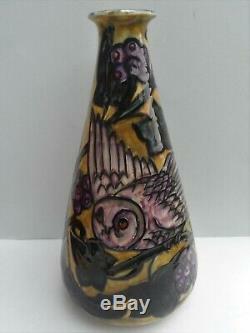 No losses or scratching to the body of each vase. All tube lining and paintwork is in very good order with no fading to the pattern. 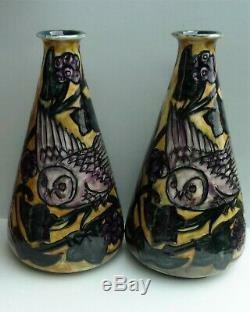 Both vases have a good true sound to them when lightly tapped. Overall 2 very good examples. We do not post to overseas forwarders who are based within the U. Parcel Force Global priority tracked. 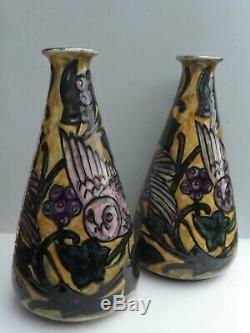 The item "A fine pair of George Cartlidge Morris Ware Arts & Crafts owl vases. 1918" is in sale since Friday, March 8, 2019. 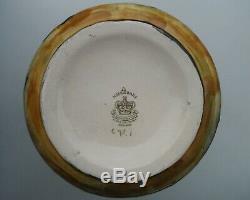 This item is in the category "Pottery, Porcelain & Glass\Pottery\Hancocks". 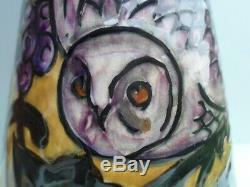 The seller is "d3stinationvenus" and is located in Leek. This item can be shipped worldwide.